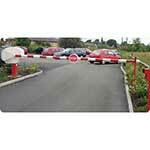 The widely specified Tiger barrier is suitable for roadways measuring up to 7 metres wide. Tiger automatic security barriers for car parks/access roads are some of the most versatile options currently available for monitoring and restricting access to parking areas and roadways. With the ability to span roadways up to 7m wide, the barriers ensure a high degree of control over foot and vehicular access. With a comprehensive range of features included as standard, customers can be assured that the barriers are suitable for a wide range of situations; for example, a remote push-button console is included in the basic package. The entire system is designed to be durable and corrosion resistant. All the individual components are zinc-plated, which ensure the barriers will last for many years. In addition, the red coloured frame is coasted with PPA plastic, which is a material that resists fading, peeling, cracking and rusting, while a moulded polyethylene cover provides an added level of protection. ‘No Entry’ and ‘Stop’ signs can be mounted on the high visibility red and white striped arm. The lubrication system on-board works automatically to ensure easier movement. Customers are able to choose either single or three-phase electricity supply. An external manual override makes it easier to handle unexpected situations and an optional folding skirt is available.